Zac Brown Band is an American country music band based in Atlanta, Georgia. 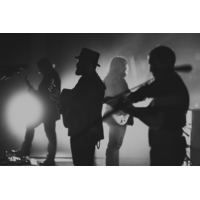 The lineup consists of Zac Brown (lead vocals, guitar), Jimmy De Martini (fiddle, vocals), John Driskell Hopkins (bass guitar, vocals), Coy Bowles (guitar, keyboards), Chris Fryar (drums) and Clay Cook (guitar, keyboards, mandolin, steel guitar, vocals). The band has toured throughout the United States, including a slot on the 2009 and 2010 Bonnaroo Music Festival. They have also recorded four studio albums, and charted five Number One singles on the Billboard country charts: "Chicken Fried", "Toes", "Highway 20 Ride", "Free", and "As She's Walking Away", in addition to the single "Whatever It Is," which peaked at number 2 on the same chart.